encountered is provided after the table. Some conclusions appear to be reasonable from the data collected. First the combination of 7.5 grains of Blue Dot with the Liberty 145 grain bullet (actually designed for the 7.35 Carcano) is not a good load. The pressure level reached, which after some additional reading appears to be from the reduction in space in the cartridge due to the relatively long (.970 in length)145 grain bullet, is too much for the rather thin walls of the Bertram cases. A major reduction in powder level reached a point where no splits occurred allow accuracy was generally poor. It appears that the .299 bullet is not stabilized enough. Finding a .301-.302 already cast bullet was a problem so a custom sizing die was ordered from Lee in .302 and a lighter and shorter (.835 in length) round nose lead bullet of 130 grains and .308 diameter was found in the Huntington's catalog (item #410). The Huntington bullets are lubed but its type is unknown. After sizing, Alox was used to re-lube but on later trials this did not seem to be needed. The gas checks used were a soft type, mainly used by BP reloaders and are available from CFVentures (509 Harvey Dr., Bloomington, IN. 47403-1715, no phone or e-mail, $25.00 for a trial set). Now that a reasonable level of accuracy has been obtained some experiments with increased powder loads will be undertaken. The search for the right bullet for the Sherwood continues with both success and failures. Liberty Shooting Supplies has gone out of business and Huntington's has stopped carrying the .308 lead bullets used previously. Graf & Sons carried for a very short time a 150 grain spire point .300 bullet designed for the 7.35 Carcano. Some cartridges were loaded with 7.5 grains of Blue Dot which again resulted in split cases. A lighter load of 5.0 grains was successful. Various users of the .300 Sherwood have been kind enough to share their loading information. I have reprinted them with e-mail addresses? AGAIN, THESE LOADS WERE VOLUNTEERED AND HAVE NOT BEEN CHECKED, PLEASE USE AT YOUR DISCRETION. Mr. Greg Mazur (mazudrilling@yahoo.com) has provided extremely useful information on reloading for the .300 Sherwood in the e-mail below. He has given me permission to add this to the webpage with the standard warning “… all loads be approached in increments due to variations of bore/barrel and firearms most often apparent in primer deformation.” Personally his information would have saved me many problems (and a lot of split cases). His use of IMR 4198 powder really helps in filling the case much better. I have tried his instructions for the Hornady bullet (Graf and Sons is currently carrying them) with IMR (reduced by 10% just to make sure) and had the best accuracy I have ever had and only one split case (probably my fault on belling the case). I have been shooting and reloading the 300 Sherwood for 8 years. Approx 180 rds per year. My gun a Simson SXS cape gun , 300 Sherwood X 16ga. barrel length 28 in. 5 folding express leaf sight. As a hobby I hunt and collect with Drillings and combination guns, thus my email address "drilling" suffix. I find the 300 a perfect turkey/coyote/woodchuck/small game gun. Since I use my guns for hunting , only jacketed bullets that expand at reasonable velocities are considered. I detest lead cast bullets, they perform poorly on meat, lead the bore and require special reloading techniques. Since most of my guns are made around the turn of the century I subject them to no more than adequate pressure to achieve bullet upset. I have no idea why you experienced a damaged barrel while firing a jacketed bullet from your 300 sherwood. There are other possible variables to consider and it goes against all reloading knowledge to expect it so. Cast bullets, possibly the only bullet available during the inception of the 300 Sherwood, I am confident that had jacketed bullets been available they would have been employed along with todays variable progressive powders. First task ( which I do with all rifles subjected to cast bullets ), I undertook with the 300 was to clean the rifling/bore of lead. Various commercial solvents were used as well as mercury. Mercury will chemically leech lead from the bore. This produced nice clean rifling and allowed a true bore to be exposed that miked @ .30010 in. I never felt that any bullet over 130gr would allow me the velocity within the pressure boundaries that I had set. I also felt that the powder needed to occupy 3/4 of the case to allow good consistent progressive powder results. 128gr Hornady pointed softpoint dia .300. 128gr spitzer softpoint dia .298 (actually marked 123gr) available from Buffalo arms. And last a 110gr remington soft point round nose (M1 carbine bullet) dia .307. This bullet dia .307 is run thru a sizing bullet die (avail from CH Tool) and sized down to .300. All three of these bullets met my criteria, the Buffalo arms bullet available inexpensively and the Rem carbine bullet the least expensive and greatest velocity. The Hornady is hard to find and does not "upset" as well as the other two but works well. Here are my loads, approach all reloading in increments, observing signs of excessive pressure, no two guns are the same. Bell cases to max depth to prevent damage during bullet seating. Need to remove die bullet seating plug to seat Rem 110gr bullets deep enough. All cases full length sized. No bullet crimping performed. Experienced very few case splitting. Subject: Recent Sherwood loading data. The introduction of pistol defense bullets has provided a series a low velocity quick to upset bullets. These bullets lend themselves useful to turn of the century rifle cartridges which are in general low velocity as compared to more modern cartridges. The 30 cal mauser 308 dia produced in XTP by hornady is such a example. Although .308 in size it has a thin jacket easily sized down to .300 with CH sizing die in one pass. At only 86 gr it provides the lightest bullet and thus highest velocity in a 300 Sherwood. It elevates the 300 Sherwood cartridge to were it was never able to perform given the components of its day. Results : some unburnt powder in barrel indicating close to level of inefficiency of 4198 but velocity consistent. Wet catalog penetration impressive/full double caliber upset and deep Penetration. Shoots to same point of aim as previous loads. I would like to add to my previous finding (mazudrilling@yahoo) on a suitable load/bullet. Hornady makes a 89 gr mauser 30 cal bullet dia 308 . 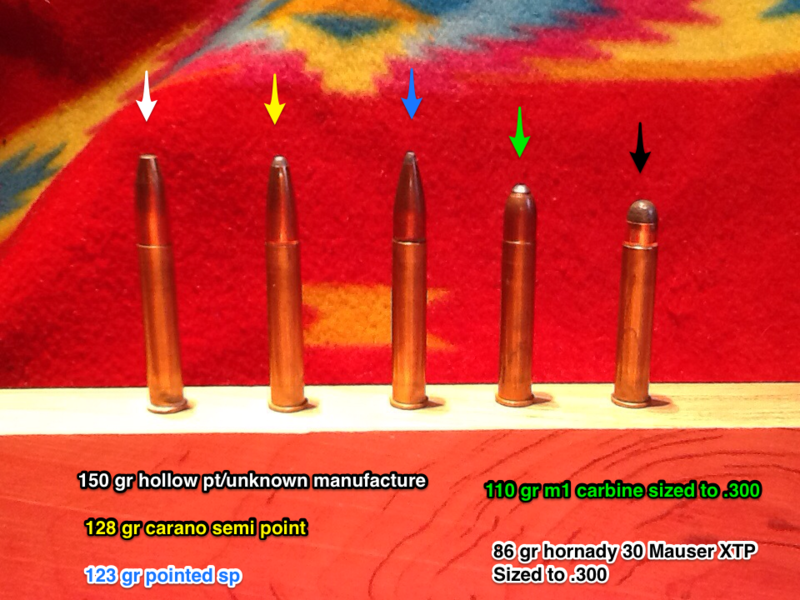 After swage sizing down bullet and load testing I have some new data to report. I also did some research on your blue dot loads and believe that case splitting was due to powder burning too fast and producing pressure entirely within chamber over too short a time period. My 4198 loads result in longer burn and gradual barrel pressure and were responsible for reduced splitting. I see no personal need to soften the case. It is thin by design, with the proper chamber diameter and progressive explosion pressure applied along with correct neck bell there is no issue. If you have a oversize chamber it could prevent splitting. Actually just de-priming and not resizing along with correct neck bell would go a long way to prevent neck splitting on oversize chamber. No two rifle chambers, or bores are "exactly" the same. A couple billion neutrinos passing thru and bouncing off the drill bit , and out the window goes exactness ! Got to work with what you have. This 86 gr bullet I have discovered is probably the lightest the Sherwood will throw. The entire exercise is to provide data on using jacketed bullets available. The 300 Sherwood was originated with cast bullets and intended as a light target rifle. My goal has been to explore its potential as a small game cartridge. There are a lot if interesting rifles sitting in European closets out there chambered in 300 Sherwood. Hopefully I can get my hands on them before the owners figure out how to shoot them. other than Bertram brass is junk. I am also playing with 360 BPE aka 9.3 X 57R and enjoying the challenge. I find that 38-55 Winchester long is a workable substitute for brass. I have a BSA NO.6 take-down in 300 Extra Long (Sherwood). I use a 147 gr. bullet with 11gr. H4227 at 1450 fps. This is quite close to the original specs. With the bullet about .36in into the case this amount of powder fills the case to at least 80%. (made from a 5.6X50R). With the bullet seated far out this is a long round. With the .300 Extra Long breech block this round will chamber. Using a regular BSA Cadet breech block it will not chamber. Since my last message I realised that there are a number of things that I forgot to mention. I am not a hunter and my only interest is getting the best performance as was originally planned when they were designing and constructing my wonderful rifle for target shooting. My first bullet mould from CBE (www.castbulletengineering.com.au) was one in 100 grain with a flat base. This bullet is fine but did not give me the results I was looking for and subsequently found this to be more suitable for .300 Rook. I ordered a mould to the original specifications which was .300 Sherwood 140 grain with 2 lube grooves and a gas check base from the very helpful team at CBE, incidentally this bullet weight is stamped on my rifle receiver next to the CORDITE approval stamp from the proof house back in the early 1900s. I am moulding my bullets from lead with an approximate Brinell hardness of BHN12 and lubing twice with Lee Liquid Alox which leaves little to no leading. The bullets that I have tested have been both with and without gas checks and I see no necessity for them at less than 1500 feet per second. After retrieving rounds fired through plastic containers filled with water I was pleased to see that there was very little lead melt to the base at my preferred speed of 1250 feet per second. To improve my accuracy , but to stay with period equipment, I had a Parker-Hale PH16 peep sight fitted and now get great results. It is important to mention that the original Birmingham Small Arms (BSA) technicians somehow hardened the surface that the bolt travels in to an amazingly hard finish, this was an unexpected find that damaged both drills and taps when mounting the sight. On one final matter I found that when shooting with a faster pistol powder that there were more consistent results if I placed a small plug of natural cotton wool over the relatively small charge as this kept it close to the primer in these long cases. These excellent 100 year old guns are a joy to learn about and I wish safe shooting to you all.